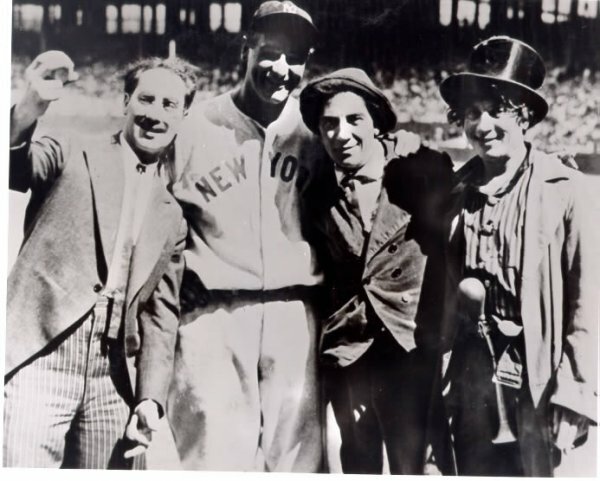 I don’t know a lot about famous harpists except for possibly Harpo Marx, who I have featured here before playing an ethereal Take Me Out to the Ballgame. 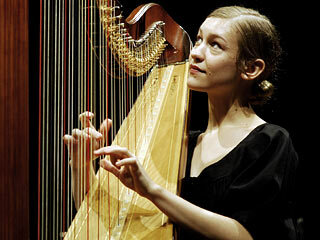 To tell the truth I can’t think of another harpist at the moment except for Joanna Newsom. My nephew introduced me to her music a few years ago and I have to admit it has taken some time for me to warm to it. It has not been the harp playing, the sound of which I really love. No, it was getting past her voice. It’s a high, flat voice that some have called childlike, a term to which I understand Newsom objects. Others have said it is reminiscent of the voices of the Appalachian hill folk and their traditional songs. I kind of find it in somewhere in between and had a tough time hearing it set in contrast against the beautiful tones of the harp. But I keep listening and there are now many moments when I really see the beauty in her truly unique talent. The Sprout and the Bean is such a moment. I consider it one of the best times of the year, when my routine starts to include reading boxscores and checking the standings. There is nothing like the rhythm of baseball for me and the way it weaves together with the daily lives of people who follow the game. One of the most vivid visual images of my youth are coming up the steps of Shea Stadium at night and suddenly having the bright green grass of the diamond emerge before you. Everything was rich and deeply colored. The greens were dark, the dirt of the infield a warm clay red and the whites of the lines shining like lasers. It felt like that moment in The Wizard of Oz where Dorothy opens the door and everything changes from a bland, colorless scene to one filled with powerful, vibrant colors. I still get that same stir of familiar excitement when I see scenes of a ballpark at night, ablaze in color. So my marathon season begins and, as a fan, I am filled with optimism because my team has won its first game. Everything is rosy until that inevitable first loss which tastes bitter going down. Losing and failure, a subject I’ve discussed this week, is all part of the game and it’s how a team or player responds to failure that determines the direction of a season. That is where the drama lays in baseball. Can’t wait for the game today! Here’s one of my favorite things, one that I showed here two years ago. It’s Harpo Marx’s wonderful rendition, from his appearance on I Love Lucy, of Take Me Out to the Ballpark, one that strikes that ethereal chord I feel for the game. Have a great Saturday! Batter up! Catchers and pitchers are reporting to spring training. Baseball is in the air. Baseball has always held a special place for me. Oh, I was no more than an average player– decent bat, lousy arm and a so-so glove– but there was pure magic in seeing the heroes of my youth and hearing the stories of the early legends of the game. I remember my grandmother telling me of going to NY in 1921 on their honeymoon to see Babe Ruth play. Ruth hit a double and a triple as she recalled. I remember sitting with my grandfather, the mythological Shank ,who used to call me “The Rat,” and watching the World Series in the afternoons after I had my tonsils out in 1968. 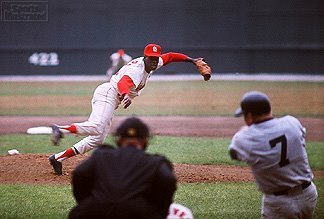 The St. Louis Cardinals were playing the Detroit Tigers and I was introduced to one of the heroes of my youth, Bob Gibson. Gibby was it for me. The toughest guy out there, one whose competitive fire is still legendary. So dominating as a pitcher that baseball changed the mound height because they felt the hitters needed help since he was practically unhittable. I read his early autobiography, From Ghetto to Glory, numerous times and that made him an even bigger hero to me. He was eloquent and college-educated, a rarity for ballplayers of that era, and his story was compelling. He remains a hero. Baseball was always played at our house. My dad was a pretty fair pitcher. He would play catch with me and my friends and would break out his knuckleball. It was uncatchable, having a spectacular drop that would appear to be entering your glove only to end up hitting you in the stomach. I was never able to master the pitch but still appreciate a well thrown knuckler. Other times, I would pitch to him and he would hit flies to my brother in the outfield. Periodically, he would hit hard liners back at me. They would bang off me or make me dive out of the way and he would cackle. I would then try to drill him with the next pitch, which would make him laugh even more because he had gotten my goat. I would calm myself and wait until he would pitch to me, waiting for the perfect pitch when I could send one back at him, making him duck or dive. Over the years baseball has become my calendar for the passing of the year and is a comforting friend on the days when the world seems ready to implode. I am still captive to the numbers and legends of baseball, one of those romantics who see poetry in a game based in tradition.